Camp David Duplex Beach House est une belle maison entièrement meublée et extrêmement propre, loin de chez soi. C'est l'endroit idéal pour votre famille, grande ou petite, pour profiter de la vue sur l'océan, de l'air salé et pour simplement vous détendre. Si vous souhaitez louer les deux côtés de ce duplex, veuillez contacter Tina pour plus d'informations..
* L'âge minimum pour louer cette maison est de 30 ans. * Les tarifs sont indiqués «par côté» du duplex. * Pendant la saison estivale, locations du samedi au samedi uniquement. Home was perfect for our family of 4. Kids got their own spaces upstairs. Pool was cleaned regularly, and home had everything we needed for our stay. Beach was across street and clean and peaceful! Tina checked in with us a few times to make sure we had everything we needed. We loved our stay and hope to be back again soon! The property was clean , beautiful, and everything we needed. The property was extremely nice and accommodating. Mrs. Tina made sure everything was taken care of and made sure everything was clean and ready to go considering the storm that had just came through. We will be renting again if she will have us! Thank you Mrs. Tina for everything. We had a wonderful time at Camp David beach house. The close walk to the beach is wonderful and the pool was great. Tina has thought of everything, with the hoses to wash off toys, etc and the outdoor shower, in addition to the Adirondack chairs under the porch overlooking the pool. She was also very attentive to any needs we had while we were there. While the inside could use some updating, it is a great place. The furnished kitchen was great for cooking meals when we didn’t want to go out. The close proximity to all of the restaurants and activities is excellent, yet the house is far enough from the main traffic that the area is not noisy or congested. Our family loved our first stay in Gulf Shores, and will definitely be back again! We had a good stay at Camp David this past week. 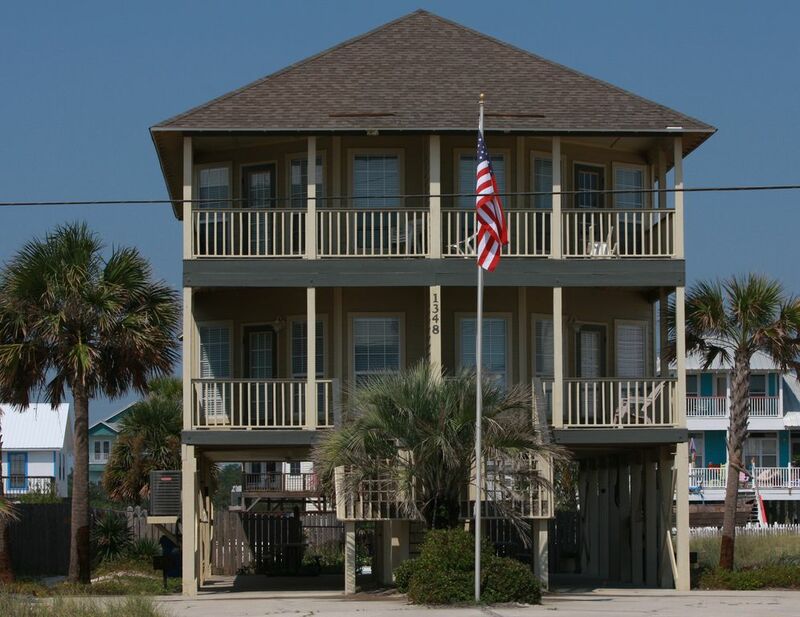 The property is well designed and we particularly enjoyed the pool, the carport rocking chairs and picnic tables and the dolphin swing for the littles. It is right across the street from the ocean which made it convenient for going back and forth with the kids. Some items in the house did not work well and could use attention (internet kicked us off alot, key box was damaged by salt air, lights up stairs and by the sink were either broken or needed new bulbs), but overall we had a great stay and would recommend this property! Clean, comfortable and all the amenities of home. Great location to everything one would want, yet just far enough out of the hecticness. Tina is a great host and genuinely concered about your comfort. Would stay again without hesitation! Rates are for 'one' side of the duplex and subject to change until reservation is confirmed. Holidays & special event rates may vary. Refundable security/damage deposit is $300/per side and is due within seven days of booking reservation. It will be refunded within seven days of check-out, provided everything is left the way it was found. Renters must sign and return our Rental Agreement and Rules & Regulations Agreement Forms, before check-in. * We do not rent to anyone under 30 years of age or Spring Breakers.